Making the transition from personal to professional use of social media can be challenging. Job seekers, employees, even bosses now recognize that businesses can benefit from a social media presence, but often they aren’t quite sure how or where to start. 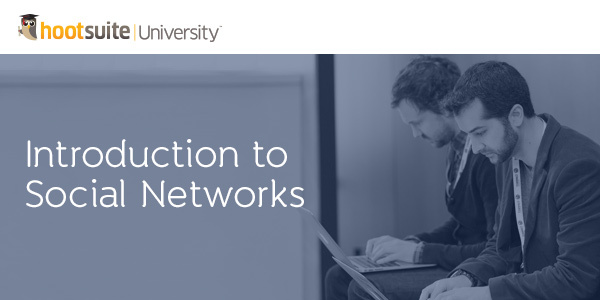 To help you understand how social media can benefit your career and your organization, HootSuite University has released brand new courseware covering an Introduction to Social Networks. This video course will teach you exactly how to get the most value from social media with a simple, easy-to-follow introduction to today’s top social networks. The perfect resource for individuals looking to get started with social media, this 20-minute course covers all of today’s top social networks, including Facebook, Twitter, Google+, LinkedIn, Instagram, YouTube, Pinterest, Tumblr and Foursquare. Alongside the course, you will have the opportunity to navigate and complete your own workbook and self-assessment exam. These resources help you cement your learning and ensure you’re getting the most out of the material. Learn how social networks can help you succeed in business. Enroll in HootSuite University today to access this 20-minute video lesson.